Ibtihaj Muhammad, the first U.S. Olympic athlete to compete while wearing a hijab, has inspired other Muslim athletes. Mekahlo Medina reports for the NBC4 News at 5 p.m. on Monday, Aug. 8, 2016. It's been quite a run for U.S. Olympian Ibtihaj Muhammad. In 2016, she became the first American athlete to compete while wearing a Hijab. Now... she has a doll in her own likeness courtesy of Barbie. At the Glamour Women of the Year LIVE Summit Monday, Muhammad became the latest honoree as part of Barbie Shero program that recognizes female trailblazers. Muhammad was presented the doll by last year's Shero, body activist and model, Ashley Graham. 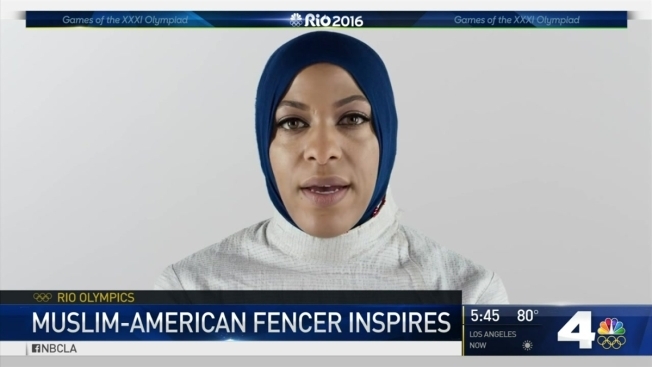 Muhammad, one of Time magazine's "100 Most Influential People" of 2016, became the first female Muslim-American athlete to earn a medal at the Olympics, earning a bronze medal in the Team Sabre. The doll will be available for purchase in 2018.